Isn’t it funny how some things just fall in to place? The other day i was walking back from a kiddy play date, when low and behold i discover a front door sitting out the front of someone’s newly renovated house ready for disposal. Ok, so you may be thinking – ‘but Sam, it’s just a door!’. Well i’ll tell you that i have been after this particular style of front door for over a year now and haven’t managed to find it ANYWHERE! 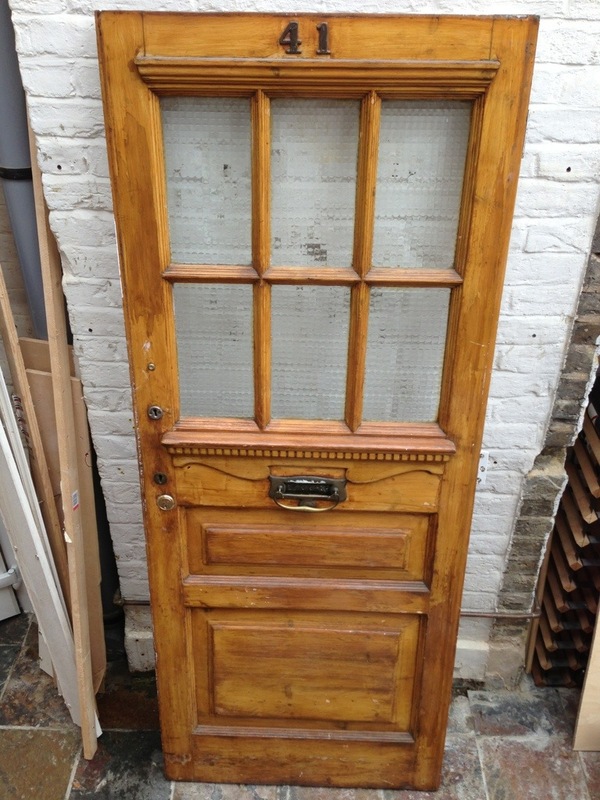 ‘ve found some similar (but different) doors and they are priced at over a thousand pounds. Ouch! So i mull it over for awhile.. how the heck am i going to get this solid door home while wheeling two kids in a buggy… hmmm?? RUN! So i sprinted home to the neighbours, knocked on the door (thankfully my neighbours are lovely and have always been offering to look after the kids), quickly wheeled them into their house and sprinted back for the door. Let me just stop here.. it’s not ofter (well ever) that i scavenge things from peoples rubbish. So i just had to rip the bandaid and be done with it before any of the other neighbours saw me. *blush*.. So there i am, the door is still there and WOW it was heavy. It took me quite some time to drag this thing back home. Luckily my neighbours husband who i abandoned the kids with came running down the road and helped me. Don’t worry, the kids were well and truly being entertained by his wife. So all was good. We managed to get the door home in one piece and although it need a lot of TLC i’m pretty sure i’ll get it looking just right. Oh.. i went and got the kids after that and i vow never to a) scavenge from rubbish and b). dump my kids at neighbours last minute like that again. But hey, what are neighbours for! haha! So here it is. THE DOOR! Yes, ok, you can see that it needs quite a substantial amount of work done to it. But hey, it’s going to be a good summer project. So far i’ve managed to remove all the furniture from it – locks, hinges, mailbox, etc. Along the way i found some little keepsake memento’s on the back of the hinges showing the street where the door was originally installed. Which just so happens to be at a different address from where i found it. So i must be the third owner. 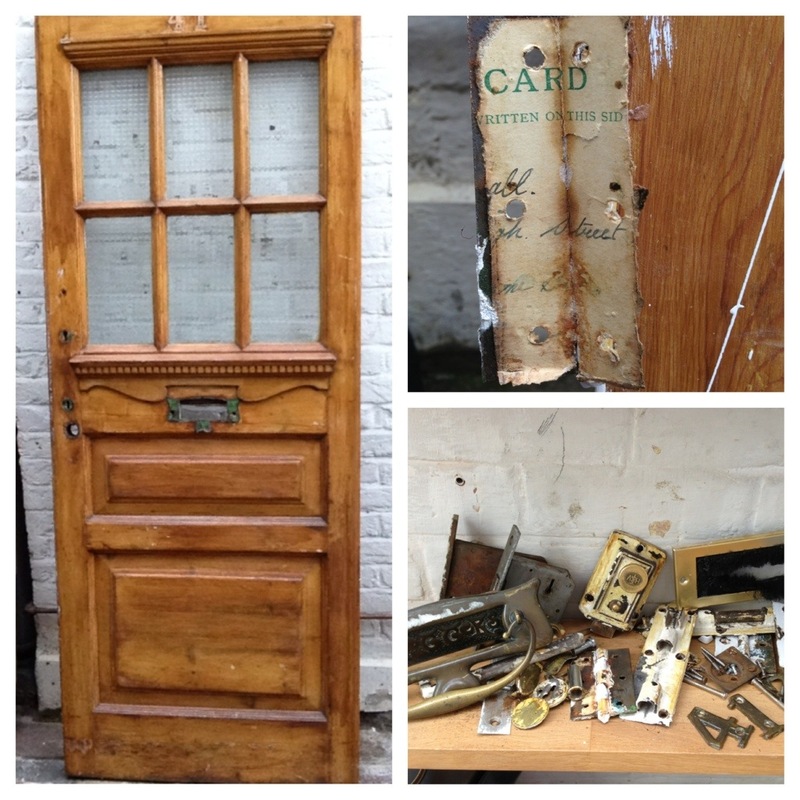 Who would have thought a door would have so much history and so many locations? So i’ll have to hang on to the memento’s and add some of my own. Love a bit of history. I often wonder why people remove all this history from houses and replace it with cheap tat? I’m all about preserving history and mixing it with modern style. Next step – although i’m a little timid about doing it… is to get the door stripped by a chemical dip. Still pondering if it’s the right thing to do, and won’t destroy the door. I may have grown a little attached to the door..
Then, some sanding, new led-light, a nice coat of paint (quite possibly firetruck red) and installing it. Can’t wait till it’s done! I’ll let you know how i get on. Please let me know if you have any tips! I’m quite obviously a novice at front door restorations! This entry was posted in DIY Daddy and tagged door, front, heritage, paint, project, restoration, spring, strip, wood by whysamiam. Bookmark the permalink. You can never go wrong with a red front door! Unless your house is green like mine. Sigh.